What makes up your personality? Are you extroverted or introverted? Some may say personality starts with whether you’re one or the other. Others will add to that and say it’s influenced by your temperament or general nature too. Our personality, regardless of what it truly is, affects our behavior. So it’s not surprising to find that many psychologists’ research on personality has given birth to trait theory. Trait theory is the study of human personality as it relates to their behavior, thoughts, and emotions. The big 5 personality traits are a result of trait theory and unlike the Buzzfeed quizzes we know and love, it’s likely a more accurate description of personality—and more useful as a result. Though it’s not entirely clear, the big 5 model for personality first emerged in the 1960’s. However, it became a more researched and advanced model in the 1990’s as more psychologists began studying it. Today, it’s a robust, empirical, data-driven model. Many modern psychologists utilize the big 5 model because it can apply universally and it provides a measurable means to understanding personality. The point of it is to measure the degree to which particular personality traits are expressed in an individual. In other words, you exhibit each of the five traits, but at varying levels. Essentially, this model helps you, and others, understand what makes you tick. Sometimes referred to as OCEAN, CANOE, or the five-factor model, the big 5 model encompasses five key attributes of a personality. Those five traits are openness, conscientiousness, extraversion, agreeableness, and neuroticism. Openness means being open to experiencing new or different things. Those who score high on this trait tend to be intellectually curious, willing to try new things, and more creative or unconventional. Those who score low on this trait are usually opposed to change and struggle with abstract thought. Conscientiousness refers to acting in an organized or thoughtful way. Those who score high on conscientiousness tend to be self-disciplined, strive for achievement, and follow a plan or schedule. Scoring low on this trait, you may be more unstructured in your approach to tasks and procrastinate more often. Extraversion is seeking stimulation in the company of others. Those who score high on this trait don’t mind being the center of attention and tend to be very social and energetic. Those who score low on extraversion often prefer to be alone and may be anxious in social situations. Agreeableness entails being compassionate and cooperative towards others. Those who score high on agreeableness tend to get along well with people and are more sympathetic and caring. Those who score lower on this trait can be less empathetic and seem uninterested in others. Neuroticism refers to emotional sensitivity—particularly when it comes to environmental or situational factors. Those who score high for this trait can be easily stressed and sometimes come off as worry-warts. Those who score low on neuroticism, on the other hand, tend to be more emotionally grounded and laid-back. Curious to see where you land? There are a variety of big 5 tests available online to understand where you score on these traits. And don’t worry, if you’re unhappy with any of your scores, it doesn’t mean you’ll be that way forever. As people mature or modify their lifestyle, their scores can adjust—it’s not all biological. Personality can be influenced by environmental factors too. Thus, the old saying nature versus nurture comes into play. Either way, you can see the big 5 model is a great way to understand more about a person. As a result, employers often use the big 5 personality test to ensure new employees fit with a team—or employees can use it to understand more about what career path they should take. But we feel the big 5 model has a bigger purpose when it comes to marketing, market research, and understanding consumers. As noted, the big 5 personality model helps to understand what makes a person tick. Specific to marketing, understanding personality can help identify and draw conclusions about consumer preferences, habits, and motivations. If you think about that in the context of new products, branding, and advertising, it’s easy to see how leveraging the big 5 is a no-brainer. In fact, Proceedings of the National Academy of Sciences provides evidence for how psychological targeting—such as targeting by personality—is a proven approach to persuasion. 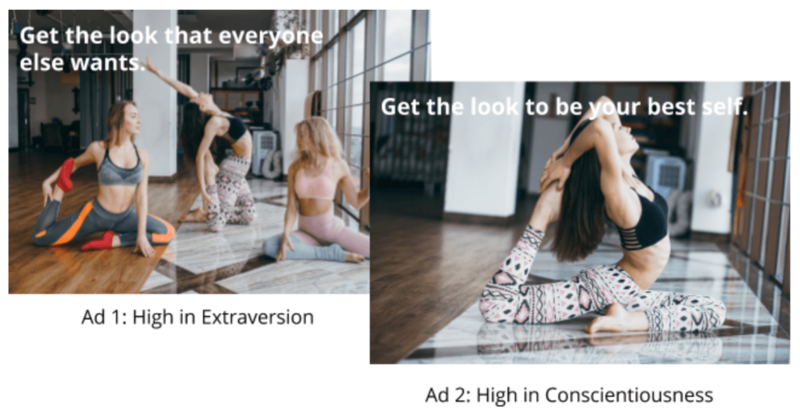 Their research tests the difference between targeting viewers with ads based on whether they are extroverted or introverted: results show that when targeting viewers based on this, conversion rates double. This shouldn’t be surprising—people are attracted to things that exhibit similar personalities to them or brands that represent the way they are. Thus, it’s so important to execute marketing activities as it relates to a target audience’s personality traits. You wouldn’t target those who are high in one trait the same as those who are low in it. For example, say a brand was looking to create ads for a new pair of yoga pants. Women high in extraversion are likely to relate to the first ad below. Women low in extraversion, but high in conscientiousness, would likely relate more to the second ad. In fact, we recently conducted a study that leverages big data and survey data to gain a deeper understanding of consumers by incorporating a variety of insights, including personality. From this research, we found the favorable audience for a brand’s new product concept scored highest on agreeableness. Using this insight, in addition to other data, we were able to help this particular brand determine what communications to use in their messaging and creative. In this case, the brand should highlight how the product aids the consumer in helping their family and promote any higher causes they support within messaging. To see the entire personality profile of this brand’s audience and our messaging recommendations, download the full report below. You’ll see, at a deeper level, how personality is instrumental to how we behave. You’ll also learn how brands can become more effective in their messaging and targeting as a result of learning more about their consumers’ personalities.